The SF PLATINUM Series’ high-density design delivers high efficiency and low noise in a compact SFX form factor without compromising continuous power, reliability, or quality. 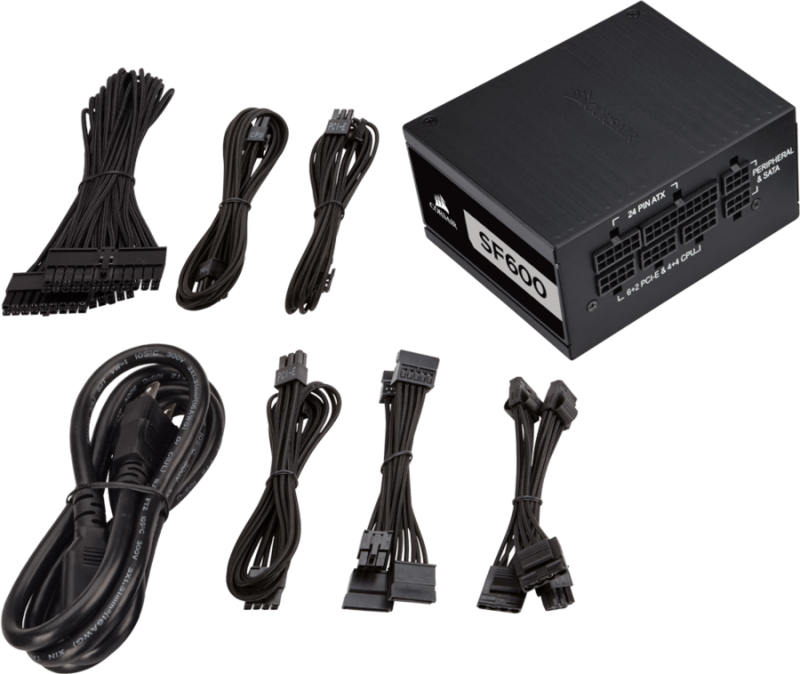 SF PLATINUM Series power supplies come equipped with premium individually sleeved cables featuring a flexible paracord sleeve, ready to become part of your new high-end PC. The individually sleeved cables also make routing and cable management a breeze, with a lower profile and added flexibility over flat or sleeved cable kits. SF PLATINUM power supplies deliver power with over 92% efficiency to keep energy consumption, noise, temperatures, and your power bill low. By using high-end electrolytic capacitors, SF PLATINUM Series provides the unwavering power and long-term reliability you’ve come to expect from a CORSAIR power supply. At low and medium loads the SF600 PLATINUM’s cooling fan doesn’t spin until you need it, for near-silent operation. The SF PLATINUM Series upgrades the SFX-standard 80mm fan to 92mm, reducing noise and improving performance at demanding loads. SF PLATINUM Series power supplies are built around an innovative new internal design which swaps wires for soldered PCBs, delivering superb performance, incredibly stable voltages and ultra-low ripple and electrical noise. SF PLATINUM Series power supplies include an SFX-to-ATX power supply adapter bracket that allows installation into any ATX compatible case. The new bracket offsets the mounting location, allowing for more space inside any standard ATX chassis, so you can tuck your excess cables out of the airflow path. CORSAIR offers a seven-year warranty on all SF PLATINUM Series power supplies, your guarantee of reliable operation that will last across several system builds. 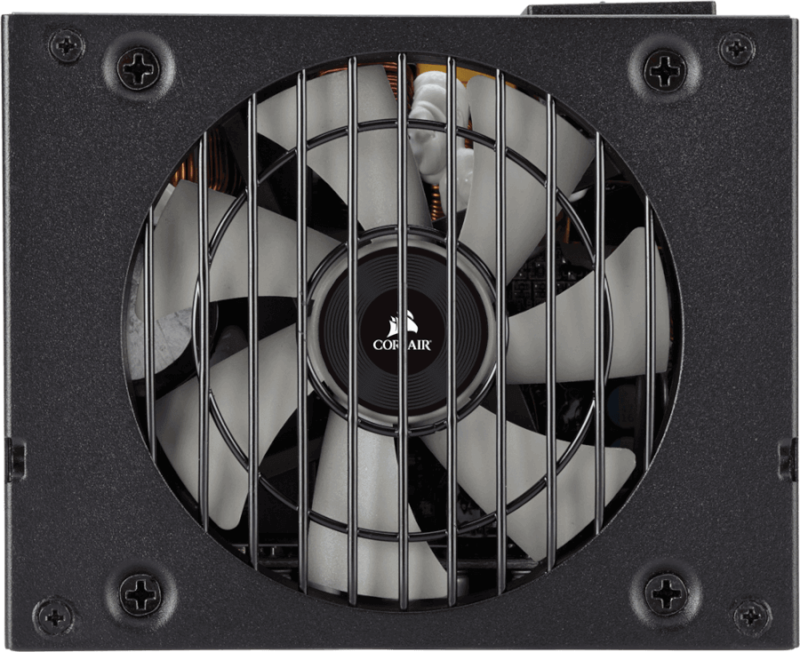 If you run into any problems during the installation or use of an SF PLATINUM Series power supply, CORSAIR global customer support is ready to help.